There are many different STEM careers and many of them have shortages. Did you know that only 1% of New Zealand’s population is made up of engineers? In 2014, 5% of graduates at bachelor’s level or higher had studied engineering. Compare that to the OECD average of 12% and we're lagging well behind. You can help decide the future of STEM careers by donating a bit of your time to help inspire and spark wonder for STEM in young Kiwis. What's a Wonder Project Ambassador? Wonder Project Ambassadors are professionals working in the STEM sector who want to make a real difference. You don’t have to be an engineer - we welcome people from all STEM fields. Ambassadors for our Rocket and Community Challenges spend an hour a week over a term of 6–8 weeks helping a teacher and their students complete a programme. Our Career Ambassadors give inspiring talks to encourage students to study STEM subjects at school so they can enter an exciting STEM career. They also help out with promoting STEM at school career fairs. As an Ambassador, you represent STEM and everything that’s wonderful about it. Your job is to impart your wisdom, passion, and excitement, inspiring students to pursue a career in STEM. "Watching the young inquisitive minds of future engineers learn and ask challenging questions was an enriching experience. It was a great way to introduce engineering concepts into a fun environment." Our primary mission is to get young Kiwis excited about a career in science, technology, engineering and maths. The project includes a series of hands-on programmes that are designed to fit seamlessly into the New Zealand school curriculum from Year 5–13. The success of the project is based on teachers and Wonder Project Ambassadors working as a team to show students how exciting STEM can be. We’ll pair you with a passionate teacher and the resources you need to run the Wonder Project successfully. Are you a STEM Professional who’s passionate about your career? Well, you’re halfway to becoming a Wonder Project Ambassador. All you need to do is register your interest online. We’ll ask you for your credentials and work history, and which programme you want to be involved in. Because you’ll be working with children, we’ll need to know if you have any criminal convictions. Once we have all of this information, we’ll pair you with a school and give you access to the Wonder Project’s resources. passion and excitement for all things STEM! Wonder Project Ambassadors give back by giving their time. All Wonder Project Ambassador under take initial training. For the Rocket and Community Challenge, once the programme starts, you’ll be needed at the school for an hour a week over a term (6–8 weeks). It’s a big time commitment so you’ll have to talk to your employer about getting the time off to participate. Our STEM Careers Ambassadors are required on an ad hoc basis, so that’s a smaller commitment. Career Ambassadors only need to give a short talk to students on their experiences in STEM, and be available for schools’ career fair days. We’ll let you know when and where you’re needed, but it’s not weekly. 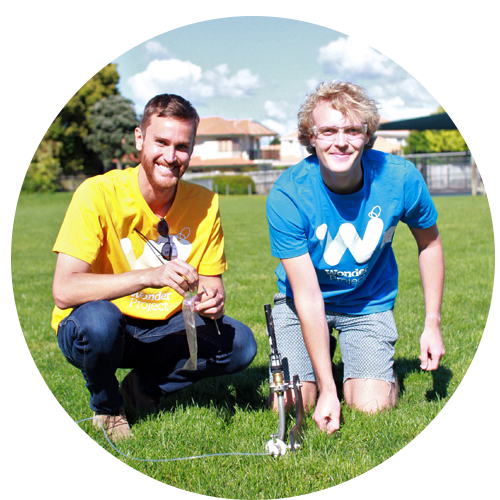 If you're an Engineering New Zealand member, the time you spend as a Wonder Project Ambassador contributes towards your required continuing professional development hours.Other professional bodies may also recognise this type of volunteer work as CPD. You don’t need to be a rocket scientist to be a great Ambassador – we’ll give you all the training and resources you need. All Ambassadors need to complete an initial Wonder Project training which will take about an hour. Once you’re a Wonder Project Ambassador, you’ll have access to resources that will show you how to run our three programmes easily. We’ll take you through the programmes and give you confidence through in-person and online training. As a Wonder Project Ambassador you’ll be working alongside a teacher in a school that we pair you with. Some teachers might not have a STEM background and that’s okay. You’ll work together with the students to run your chosen Wonder Project programme. For the Rocket and Community Challenges, you’ll need to meet up with your teacher beforehand so you’re prepared with everything you need to run the programme successfully over the term. lift the profile of the company you work with. The Wonder Project is Engineering New Zealand’s programme for schools and we’ll be with you every step of the way - even if you’re not an engineer. We’ll be in touch with you before, during, and after the project, making sure you feel comfortable and supported. We have a dedicated team who will be available to answer your questions Monday to Friday. Need something to convince those higher up? Here's all the benefits for you and them.